Five of six cities have appealed orders from the Iowa Department of Transportation to remove traffic enforcement cameras that the DOT says don’t meet their guidelines. DOT director of traffic and safety, Steve Gent, says today was the deadline for appealing. “The Iowa DOT has received appeals from Muscatine, Cedar Rapids, Sioux City, Des Moines and Council Bluffs. And then Davenport, they’ve chosen not to appeal the automated traffic enforcement ruling,” according to Gent. The DOT asked that 10 of the 34 cameras across the state be removed after creating rules in February of 2014 that required the cities to show the use of the cameras improves safety on the state roadways where they are installed. 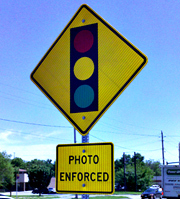 Motorists should note that the cities can still operate the cameras until the outcome of the appeal is decided, as Gent says the DOT won’t take any action to try and turn the cameras off during the appeal process. If the DOT rules against the cities, they still have another step to try and keep the cameras. “The city of course can take it to district court, and then on through the court system, as anybody has those kinds of opportunities with their government,” Gent says. The cameras bring in millions of dollars in revenue to the cities and have been controversial since they began operating.